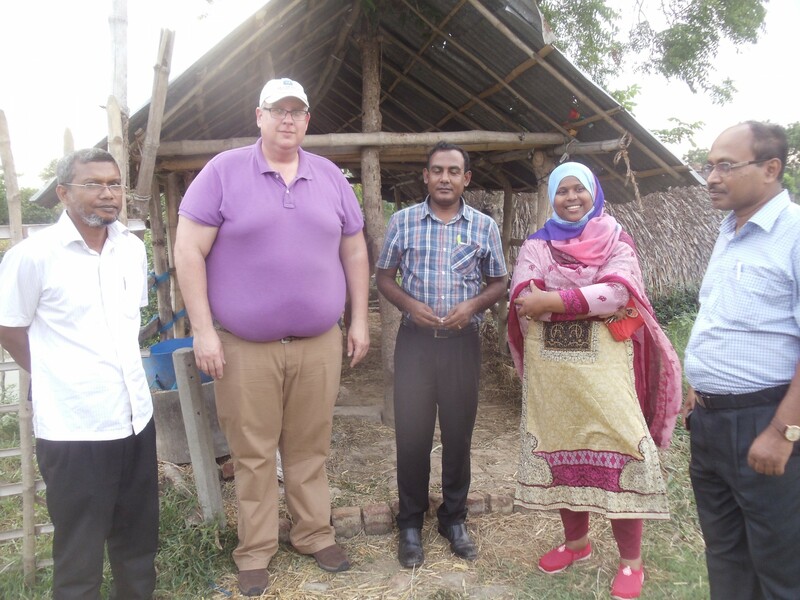 A farm visit to Khulna, Bangladesh. She received training in husbandry and aquafarming (fish farming) from the Department of Youth Development. She used a 30-acre plot of land her family owns to start her farm. In May, I experienced my first international volunteer opportunity, something that many of my fellow UW-Extension educators have done when they can link the volunteer work to their academic work. While I have traveled extensively on my own, this was the first time I volunteered on a trip. This opportunity was presented by USAID grant recipient Winrock International through the Farmer-to-Farmer Program. 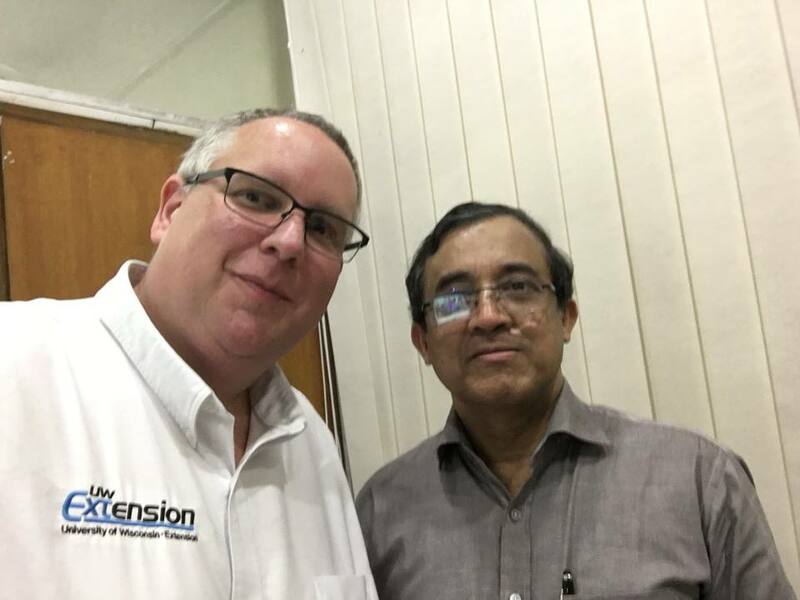 I traveled to Bangladesh in May for 18-days, where I worked with the Department of Youth Development, part of the Ministry of Youth and Sports. The project I was assigned was to work with this department to conduct a needs assessment of current technical training, and to propose a curriculum for entrepreneurship training. In my first week in Bangladesh, my hosts took me to Youth Training Centers in Dhaka, Jessore, Rangpur, and Khulna. During these stops we visited technical training centers operated by the Ministry, where training in agriculture and agribusiness, fabrics production, modern office systems, air conditioning repair, and other technical fields is offered. Unfortunately, the Bengali economy cannot keep up with the 160+ million population in the area of job creation. The Department of Youth Development is placing an increasing emphasis on self-employment and entrepreneurship as an alternative to employment. Garment and fabric production is a growing industry in Bangladesh. 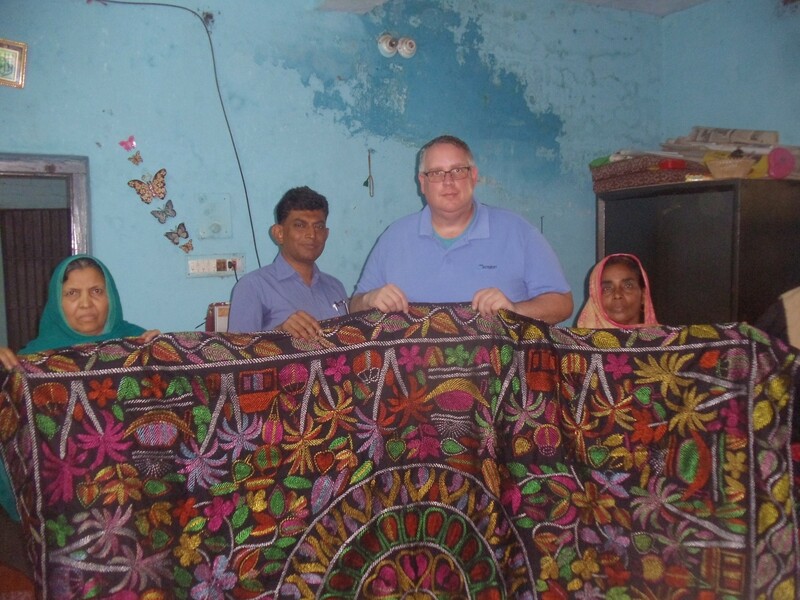 During this visit to a fabrics and handicraft goods manufacturer in Jessore City, we saw the items that she manufactures and distributes (primarily to stores in Dhaka, and some exports to India). She employs over 300 people in her city who hand knit, and hand and machine sew goods. In addition to the training centers, we also visited entrepreneurs at each location that received technical training and then started a business. Some of these entrepreneurs started their businesses with family property and money, others accessed Department of Youth Development loans, repayable within 24-months for amounts up to 50,000 Bengali Taka (or about $620). These entrepreneurs started farms (dairy, goat, and/or chickens), aquaculture farms where they fish farm (tilapia, prawn, carp, and/or catfish), and fabrics & handicraft businesses. Some of these businesses are operated only by family members, others are contributing jobs to the Bangladesh economy. Following these visits, I completed a proposed 2-week / 80-hour entrepreneurship training curriculum. I presented an overview of this curriculum to Anwarul Karim, Director General, Department of Youth Development, Ministry of Youth & Sports; and his senior leadership team of youth trainers and educators. Following feedback from the Director General and staff, I made necessary revisions that met their needs. I then conducted a two-day seminar to 14 senior trainers of the department, where I trained them on how to deliver the curriculum and make additional changes to meet their local needs. Following a presentation of my proposed entrepreneurship curriculum with Anwarul Karim, Director General, Department of Youth Development, Ministry of Youth & Sports. As I wrap-up the logistics of the trip, I am already looking forward. 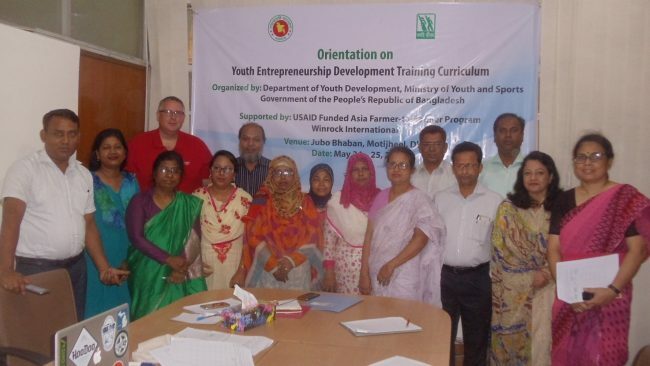 While my work in Bangladesh is complete, Winrock International through USAID will work with the Department of Youth Development to translate my curriculum to Bengali, so the training can be provided to youth across Bangladesh at the local district Youth Training Centers. Winrock International will also bring in one or two additional volunteers over the next 18-months to help the Department of Youth Development to refine their entrepreneurship training efforts. This was an incredible opportunity to share my experience working with entrepreneurs. All good experiences provide an opportunity to share and to learn. This trip provided me with many opportunities to learn about the Bengali culture… a trip I will not forget. Now that I am back, I am hoping to take some of my work, and use it locally to provide entrepreneurship education to individuals and groups that may not be currently served by resources from the Small Business Development Center and other entrepreneur training and technical assistance programs.